Over 500 students and graduates from Tomsk Polytechnic University participated in the Gazprom Career Fair that was held yesterday at the International Culture Center of TPU. 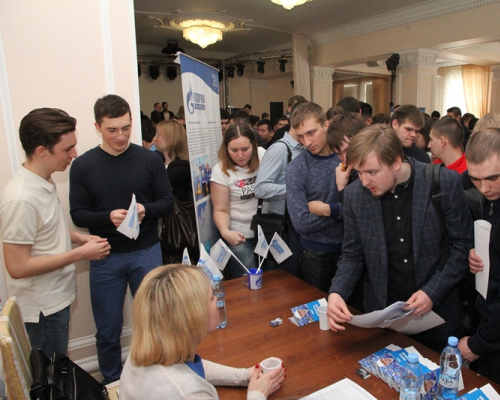 The students attended presentations of Gazprom subsidiaries, contacted representatives of its enterprises, learnt about company working conditions, career prospects and had a chance to submit applications to potential employers. During the event Tomsk Polytechnic University was repeatedly called the base university of Gazprom and one of the long-standing providers of personnel for oil and gas enterprises, in particular for LLC Gazprom transgaz Tomsk. Aleksandr Kravchenko, Deputy Director for HR of Gazprom transgaz Tomsk, expressed his confidence regarding the fact that everyone may become part of Gazprom team. says Mr. Kravchenko. – I really hope that for many of you this event will be very useful. At present, the number of our staff is over 8,000 people and we operate in 14 regions of the Russian Federation. Now, the main objective of the company is the construction of The Power of Siberia gas trunkline, and hence, the most valuable resource is people. It is assumed that the staff number engaged in servicing the Power of Siberia will increase in approximately six times and will amount to about 2,000 employees by the time of its full operation. That’s why one of our main focus areas is our potential employees, graduates from base universities”. Gazprom Career Fair is annually held at Tomsk Polytechnic University within strategic partnership between the university and the company. Mikhail Soloviev, Deputy Vice-Rector for Academic Affairs, says that first of all the event is very important for students. “Today you have a unique opportunity to look into the eyes of your potential employers, to concentrate and justify your eligibility to the company and, of course, get an interesting place for future internship or job placement. Tomsk Polytechnic University has hundreds of strategic partnership agreements with Russian and international companies. But when we start counting them Gazprom is always the first. During the last 10 years, over 600 TPU graduates were employed at its enterprises. None of the Russian and international companies pay so much attention to people development and proficiency of its staff”. In addition to Gazprom transgaz Tomsk, TPU students attended the presentations of Gazprom, Gazprom dobycha Nadym, Gazprom pererabotka Blagoveshchensk, Gazprom Pererabotka, Gazprom transgaz Chaikovsky, Gazprom PHG. Representatives of these companies talked to the audience and answered all questions. Maksim Martynenkov, a first-year master student of the Institute of Natural Resources, knows about work in Gazprom firsthand since he had already passed internship at one of the enterprises. “After the third year of study I did my internship in Gazpromneft-Noyabrskneftegaz located in Yamalo-Nenets Autonomous District. The nature there is very beautiful and despite a different profile of my internship and a lot of work I really enjoyed it. This time I will try to get a summer internship as an oil and gas operator. I have some experience and a professional certificate, so I believe I have all chances to get a job”. Due to company demand for various professionals besides applicants from petroleum schools, students studying in other educational programs also submitted their CVs to Gazprom enterprises.